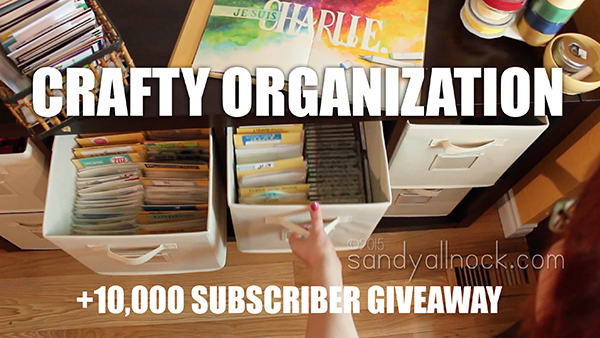 Crafty organization + 10,000 subscriber giveaway! I’m vloggin’ today! Oh my. We haven’t just had a chat in forever. But with the upcoming trip, organizing, and a giveaway…why not! Many thanks to all of you who pushed me over the top in the last few days…I was holding my breath all day waiting to launch this post! My stamps are all now happily in stamp pockets – labeled, sorted by manufacturer! So excited. I have new furniture (chairs and cabinet from The Old Cannery) and shelving (from Costco)…I still have more on the crafty organization to-do list, but it looks so nice and professional in my office already, I’m just happy. YAY! It was so much fun to pack goodieboxes! Each one has stamps, ribbon, embellishments, dies – tons of goodies! Some are gently used, some are brand new. Some of the dies were part of sets at one point but got separated from their friends….but I think any of them can be used alone, so they’re still treats to use on cards! 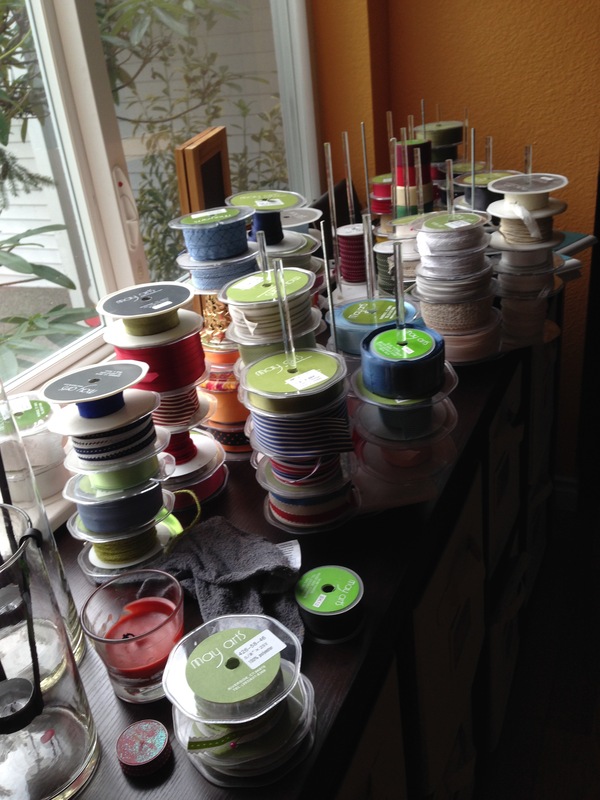 This was taken the day I dove into crafty organization in a serious way, sorting ribbon…oh my! I had 5 ribbon carousels full, plus another box. It was time to get rid of some, it seemed to have reproduced like bunnies! So each box has a bunch of spools of ribbon inside. I can hardly believe it – 10,000! What a huge number for lil ol me! I’m celebrating with a giveaway! Subscribe! And in case you didn’t know, on YT there’s a little button right next to the Subscribe button that you can click, and that brings up an option to have the videos emailed to you as they come out. If I end up sending an SOS from an Italian prison, it’ll be important to get that right away so you can bail me out. LOL! Comment on YouTube! On the giveaway video and/or any other video on my channel! I’ll go through my dashboard listing of all comments that are posted from right now until I get back from Europe, and pick 10 winners. And of course will doublecheck that winners are all subbies as well, so be sure not to skip #1! I totally spaced adding these backpack pics to the post earlier – my apologies! I’m taking more than I had thought I would be taking…So I’m taking my Kuretake set, my Peerless, my Koi, and Inktense . Yes, all four, I couldn’t decide! I have several pads of papers – eventually I’ll share more about them and comparisons. The long thin item on top in the pic on the left is one of these for brushes. The little “booklets” in the center of the pic on the left are watercolor postcards and sketchbooks…I have some masking fluid, a kneaded eraser and pickup, and a cool little set of nesting water cups I just picked up (can’t find a link but if I talk anyone into carrying them, I’ll let you know!) The front pocket has more paper and journals. I know I’m going to be taking way more than I’ll ever use, but isn’t that the way we do things? lol! My camera and extra cards are tucked in as well – I’m glad this is a comfy backpack, it’s chock full! So help me feel better about still not being done organizing – what’s your next crafty organization project to tackle? Sandy, just saw your video where you were water coloring your version of Van Gogh’s Starry Night and was absolutely blown away! Ordered the Inktense watercolor pencils immediately and just got those in yesterday’s mail. I’m so excited to get started and try my hand at water coloring. Several years ago, I taught myself cake decorating by watching videos and ended up with my own little bake shop. I even made the sugar paste flowers etc and was so proud that ultimately everything on my cakes were edible. I now have Parkinson’s and am caretaker for my 90-year old father who has only one leg and in a wheelchair. Due to the stress, I can no longer handle the tedious work of baking cakes and making sugar flowers so, being the artsy/craftsy person that I am – I got interested in card-making. I enjoy digital art work, stamping, embossing etc. So now, hopefully, I will be able to add the water coloring to my resume. Having a ball with your videos and look forward to seeing more! I recently purchased a set of cubical shelves much like the ones you got and then 2 cabinets and love the organization. Just found you thru YouTube! You inspire non-artists like myself who would love to create beautiful cards with impressive and simple works of art to bring joy to others! Card making has been my avenue to desiring artistic skills! Thanks for sharing and look forward to learning from you! Congratulations on 10k subbies!! Such an AWESOME milestone!! My next organization project is to completely gut my craft room and go through EVERYTHING and then put it back in in a much more organized way! It is going to drive my hubby nuts because our bedroom is the storage area while I am purging!! Poor man! Would love to win one of these awesome boxes!! Thank you so much for the chance to! Loving the newest evolution of the craft room/office. Do you still have room to set up the tables? Is the daybed still there? Miss seeing Ciara and her bed. Just found your YouTube channel and blog. Love them both already. Looking forward to following you and absorbing some of your expertise! Congratulations! Just love watching your videos! First off, have a FANTASTIC vacation! And I also wanted to say thanks for the comparison of stamp pocket envelopes….it was great to get a visual on that! 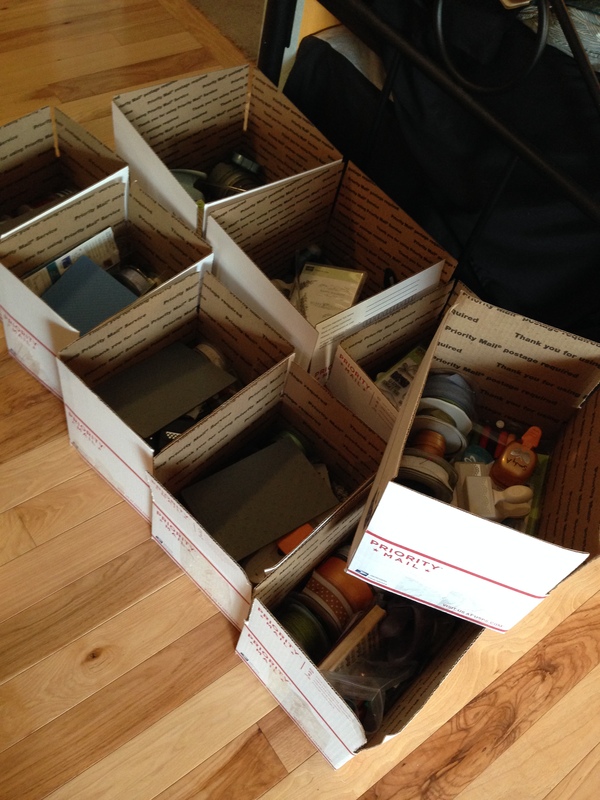 I honestly think at times I like doing the organizing more than the actual stamping…. Next project … Well, I just finished organizing my stamps and die cuts with those plastic sleeves. LOVE IT!! Next, I need a better way to store all my cardstock. Presents are good! I’d love presents! Thanks for the opportunity!